Some people might think that crossing a border is pretty straight forward…and perhaps it is in some places, but it sure wasn’t straight forward while crossing from Peru into Bolivia! 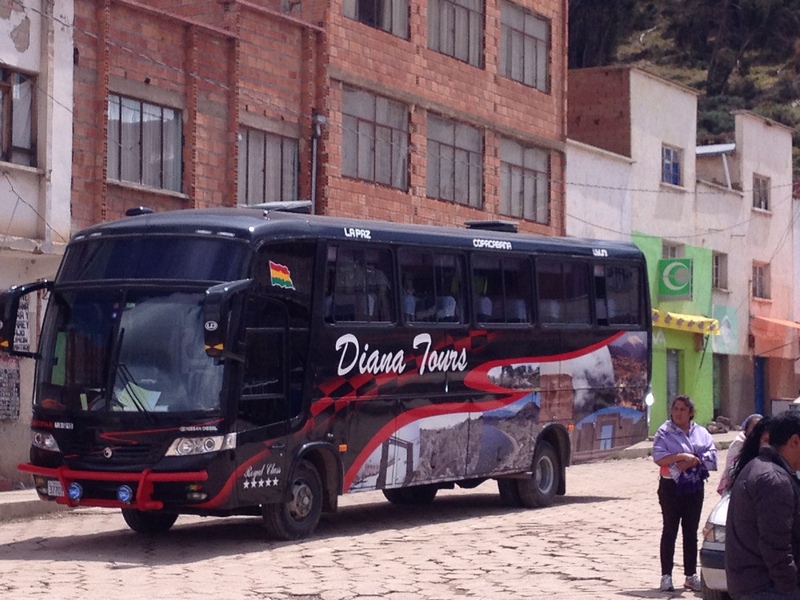 It started out easy enough: my hotel found me a bus company who would take me all the way from Puno to La Paz on the same ticket. Buying that ticket was the last easy and straight-forward part of this journey! 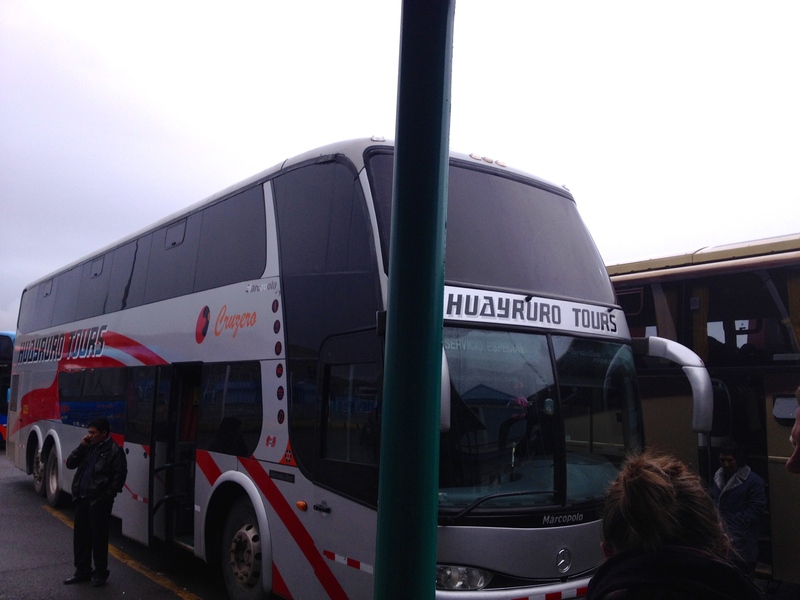 It all started on a really nice bus that left the Puno bus terminal on time. Things were looking good! We were on the bus for a couple of hours and I got off at Kasani to do the border crossing… on foot. This is where it became so confusing!! First you have to fill out the forms while you are on the bus. Then you get off the bus at Kasani and are encouraged to exchange money. Nobody exactly sure how much money you should exchange but the ladies at the exchange counter just decided that I only wanted to exchange $80 of the $100 US. I felt kinda like a sheep at this time because it was just a bunch of travelers shuffling from the exchange over to the immigration office on the Peruvian side. I give them my immigration form and they stamp my passport. This border doesn’t seem very secure…. Then the lady “stewardess” who was sorta like our immigration babysitter from the bus company I was traveling with, caught sight of my American passport and realized that I needed a copy of my passport made. I went back to the money exchange place, paid .50 bolivianos for the copy, and then found the lady again. She told me to walk up the slight incline with the other travelers to the Bolivian side of the border. 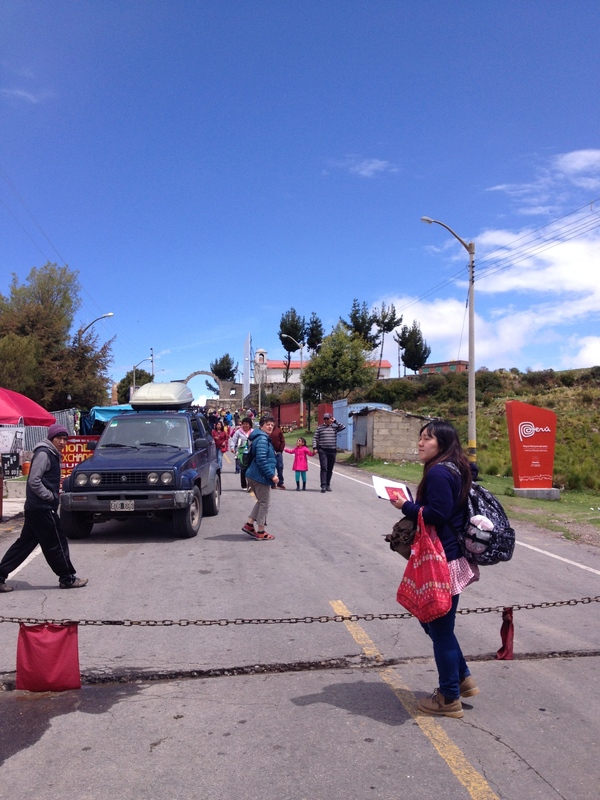 You can see ALL of the people on the Bolivian side who I got to go ahead of because I had to pay for my Bolivian visa! Despite the US Embassy page saying that I would need a yellow fever vaccination card, a passport photo, a completed immigration form, and to pay $100- NOBODY seemed to know that this stuff was required! Perhaps it was because it was really rare for Americans to use this border crossing. At the time I crossed there was only myself and three other guys waiting in the American line (where we had to pay). Everyone else was in the LONG line for people who didn’t have to pay. The upside of paying for the Bolivian visa is that instead of waiting in line for 45 minutes I only had to wait about five minutes because there were only three guys in front of me. So I arrived at the Bolivian immigration counter with my form filled out, my yellow fever vaccination card (which I got for about $10 in Venezuela! ), a passport photo, and a copy of my itinerary. The other 3 American guys that were in front of me were still filling out the immigration form that someone handed them while they were in line and they didn’t know about the other supposed “requirements” listed on the Embassy website. The Bolivian workers wanted us to only give a copy of our passports, a completed form and 160 Bolivianos ($23US- big difference from the stated amount on the Embassy website!!). Apparently they have just recently started charging in Bolivianos so I was lucky to save nearly $80! Next, we had to wait for all of the other travelers on our bus to make it through immigration. I recommend using this time to go to the bathroom because I’ve heard that the toilets on the buses are never nice. 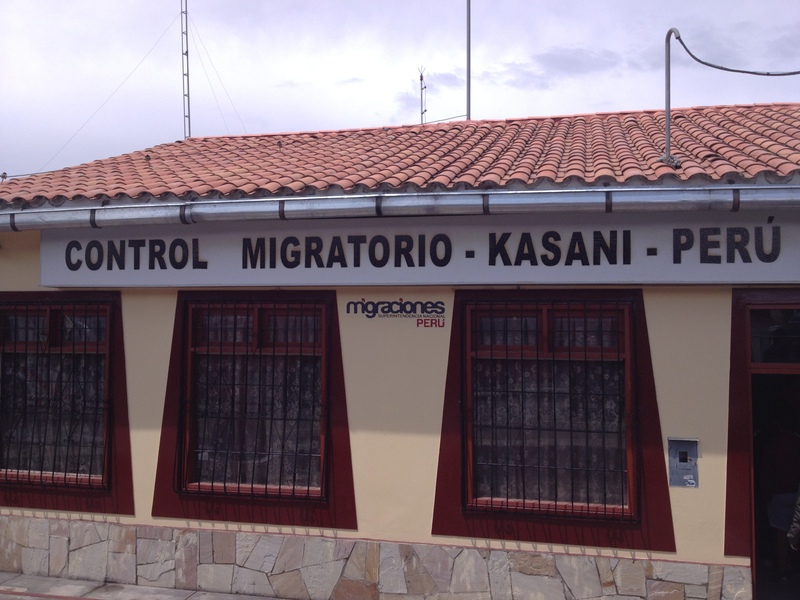 When you face the Kasani border office on the Bolivian side there is a bathroom to the left of the building in plain sight and another bathroom that is through a doorway to the right of the building. The bathroom on the left was so nasty that I could barely step through the doorway; go with the bathroom on the right (they charge 2 bolivianos to get through). We drove for about 15 minutes to get to Copacabana. Someone came onto the bus just as we were entering Copacabana to charge us a 1 B tax. At Copacabana we got off the bus, our immigration babysitter took our tickets and handed them over to a new bus company (she left us at this point), waited about an hour, and then we got on a smaller bus (with unassigned seats). We went for about 15 minutes and arrived in a small town called Tiquana. The bus on a TINY boat! In Tiquana there was nobody there to babysit me, so I shuffle along like a sheep again with the other travelers. We got to a ferry. We paid 2 Bs to take the ferry. 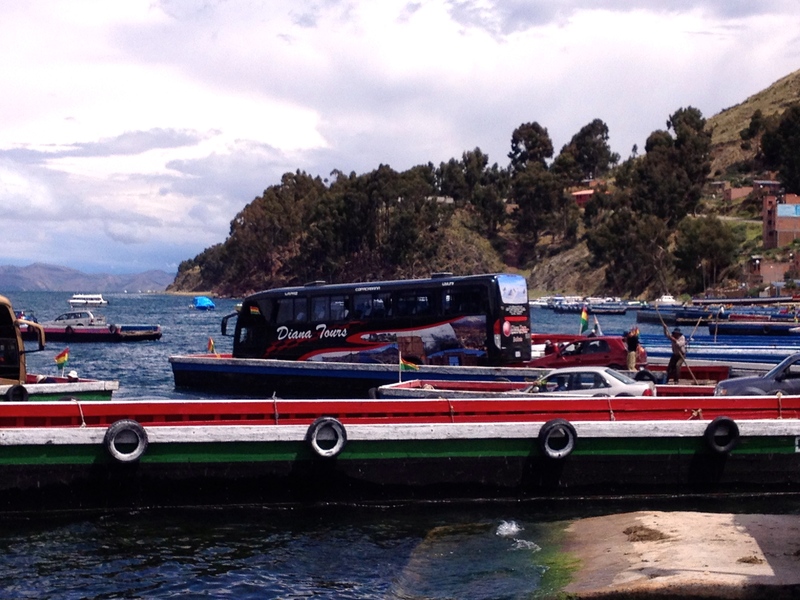 The people got into one ferry and the bus onto another ferry. I watched the bus with my backpack closely as we arrived about 10 minutes before it did. Some people took this opportunity to go to the bathroom or buy a snack. I was more interested in making sure nobody stole my stuff! Finally we all bum rush the bus when it arrives and I scramble to reclaim my window seat. 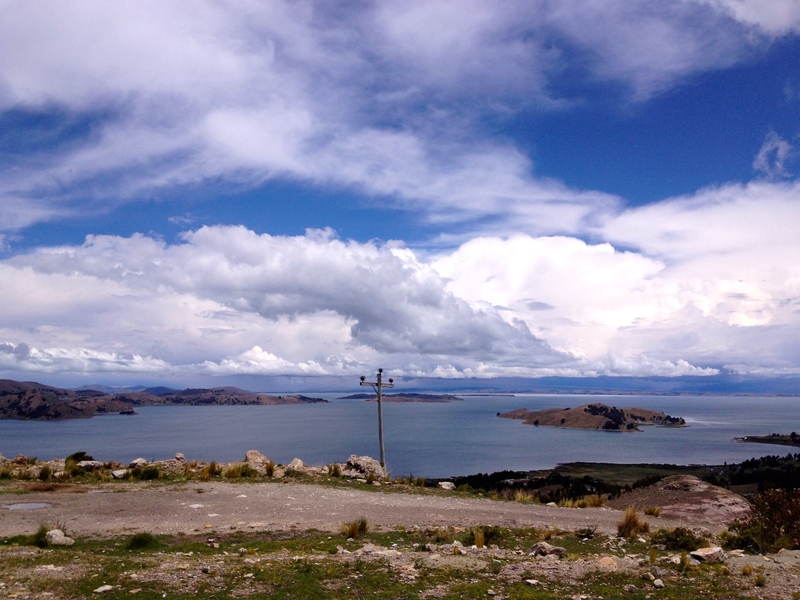 We arrive in La Paz a few hours later. I don’t know if this is a normal border crossing (no printed instructions, faulty information given on the Embassy website, no signs, etc), but since I have only ever crossed borders via airports and one time when I took a ferry from Italy to Spain, it seemed very disorganized. I hope that my post might shed a little light on the current situation…and who knows, maybe it will change by the time you attempt the crossing yourself. Remember to keep your eyes open to enjoy the lovely views along the way! Do you have a border crossing horror story? What was the best border crossing experience you’ve had? Did you have a different experience while crossing from Peru to Bolivia? Hello Amanda! Nice to find a story about the Road between Cusco and La Paz, which we travelled back in 2007: we had fled the earthquake in Lima to Cusco, were Elvira took care of us, helped us to a hotel, a tour to the sacred valley, and Machu Picchu. Believe it or not, I was just about to sort out photos and writing descriptions, thats why I googled you. We did not have any troubles at the border: we are from Denmark, I was born in Slesvig, in german Schleswig, though my father is from Copenhagen. So I have been used to crossing borders since my birth, and in 1953 it was just the same way on the danish-german border: out of the bus, into the german office, throug to the customs, walking to the danish pass-controll and customs office, and into the bus. And don’t you make any fuzz in the presence of bureaucrats, they have the eyes of Argus! So we knew how to behave, kept a low profile, and things went on smoothely. I even cracked a little joke, and got my passport back with a smile in the bolivian office. Even from the post with the machine-gun! From La Paz we went to Sucre, were our daughter studied medicine. And the whole trip was so fascinating, that we grapped the opportunity, when she was send to Sucre again in 2010 as an accountant for a NGO. Feel free to contact me, if you ever should feel like going to Denmark, OK? 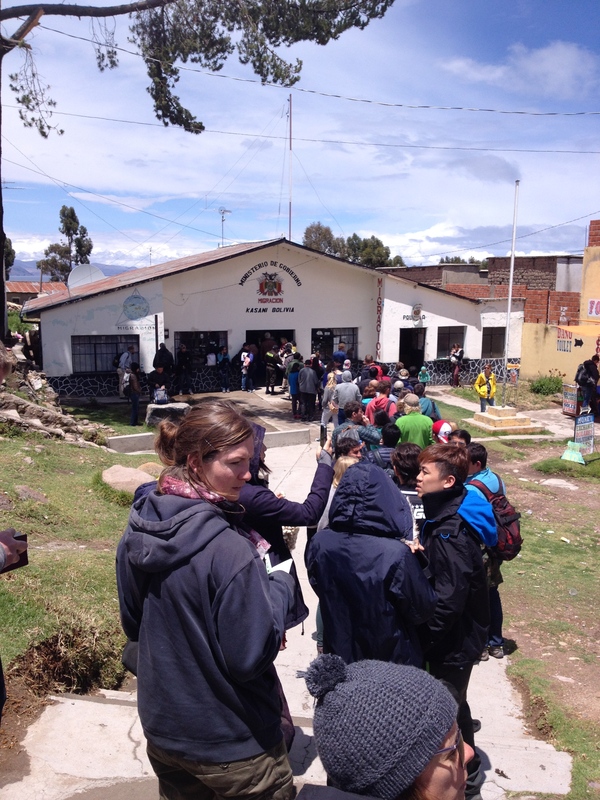 Getting into Bolivia was the easy part because the line for Americans who needed to pay was so short! I just wish that there had been a post like mine before I had to do the crossing, because I had no explanation for what was about to happen. Now I feel like I might be more comfortable in the future with land-based border crossings. I will definitely contact you if I am going to spend some time in Denmark! Hi Amanda, i am thinking of using this same crossing in the next few weeks. So, did you end up not needing the yellow fever vaccination card ( and proof of finances, and copy of itinerary)? Thanks so much for your extremely helpful post!! I did this trip over a year ago now, so things might have changed, but the only thing that I needed was a photo and a photocopy of my passport. Please reply on your border crossing after your trip. I’m going from Puno to Copacahana in September. What documents you need and the visa fee? how much and can you pay in USD? again I’m confused about the visa fee? some said 160USD, other said 135USD. I have not come across 160Bolivians. Please confirm the actual amount and in what currency so I can get the correct amount before arriving at the border crossing to Bolivia. Hey Glo, I haven’t been to Bolivia in about two years, but in case nobody writes back I wanted to tell you not to worry. There is an exchange place right on the edge of the boarder to get into Bolivia and they know how much you need. Or just get $200usd and change the rest into Bolivian money. I hope you hear from someone who has been there more recently!